My 92-year-old great-aunt gave me a baby doll, telling me she thought it had been my mother's. My mother said she'd never seen it before, but she thought it was older than her (she was born in the late 40s). I have been researching this doll, but I have yet to find anything like her! - Clothing consists of a white bonnet with red polka-dots and a non-removable "onesie" (the posterior of which is degraded to the point of being embarrassing). If you have any information on this doll, I would love to learn more about her. I'm not interested in selling her - I just wish I knew more! Unfortunately I have not... I wish I could help! 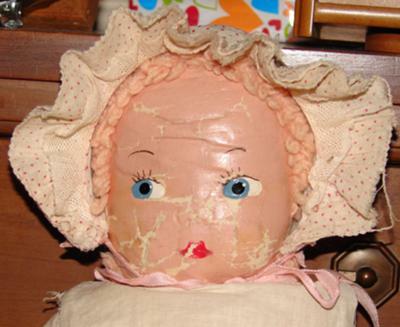 I have a doll that is very similar that I recently purchased at an estate sale. I was researching and found nothing similar except for yours. Have you found out anything about it? Join in and write your own page! It's easy to do. How? 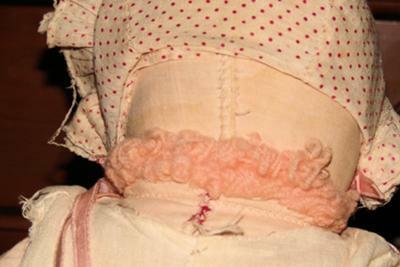 Simply click here to return to Cloth Dolls.